Der Artikel Jean Sibelius (1865-1957): The Sibelius Edition Vol.11 - Chorwerke wurde in den Warenkorb gelegt. Ihr Warenkorb enthält nun 1 Artikel im Wert von EUR 52,49. Sibelius‘ Ruhm hatte sich in Finnland parallel zur zunehmenden Bedeutung von Chormusik verbreitet. Überall im Land schossen neue Chöre wie Pilze aus dem Boden. Die Bedeutung des Genres mag die Begebenheit erhellen, dass eines seiner tiefstgründigen Chorwerke, „Menschen vom Land und von der See“ bei einem Festival in Vaasa 1912 von einem gigantischen, 1.300 Sängerinnen und Sänger umfassenden Chor uraufgeführt wurde. Chormusik nimmt im Schaffen des Meisters einen wichtigen Raum ein; auch viele Orchesterwerke rechnen mit Chor. Als Konsequenz aus der Teilung der Finnen in finnisch und schwedisch sprechende Gruppen vertonte er Texte in beiden Sprachen, und während seine Lieder meist in schwedisch sind, schrieb er Chorwerke gern und meist auf finnisch. Wie in allen Folgen dieser Edition finden sich auch hier bisher Unveröffentlichtes, Revisionen und Frühfassungen, hier vielfach erstmals eingespielt. Jean Sibelius' emergence as a composer coincided with the rapid development of choral singing in Finland, at a time when new choirs were being established all over the country. The importance of the genre may be measured by the fact that one of Sibelius's most deeply felt pieces for mixed choir, Män från slätten och havet (Men from Land and Sea), received its first performance by a choir of gargantuan proportions - around 1, 300 singers - gathered at a festival in the city of Vaasa in 1912. 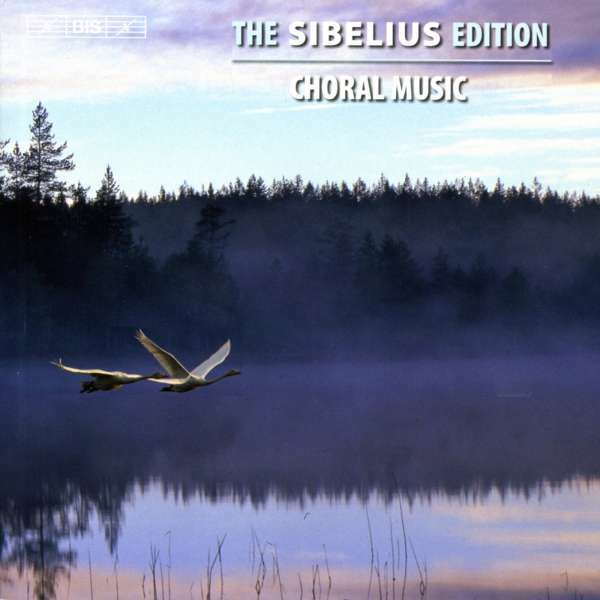 Choral music also forms an important part of Sibelius' production: besides the present collection of more than 7 hours of music for choir a cappella and with piano or organ accompaniment, there are a large number of orchestral works involving choir. (These are included in volume 3, 'Voice and Orchestra', of this edition.) As a consequence of the division in Finland between Finnish- and Swedish-speakers, Sibelius set texts in both languages, and while a large majority of his solo songs use Swedish texts, in the choral music we find a much larger proportion of settings in Finnish - often, if far from always, of texts from Kalevala, the national epic poem, or its lyric counterpart Kanteletar. 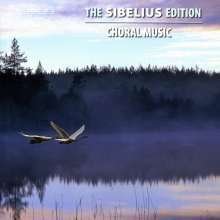 Like previous volumes in the SIBELIUS EDITION, the present collection includes not only the published works, but also unpublished pieces, revisions and early versions. Many of these are here recorded for the first time, such as the version with piano of the two choral movements of Kullervo and the reconstruction of the Cantata for the University Graduation Ceremonies of 1897. Other rarities, quite unexpected for those whose knowledge of Sibelius is mainly restricted to his symphonic output, are the two brief arrangements of 'Italian Folk Songs', and the collection of Chorales for mixed choir written during the student years in Helsinki and in Berlin. Performing this wealth of music are some of Finland's finest choirs, with the YL Male Voice Choir and Akademiska Sångföreningen sharing the pieces for male choir, with contributions from their Swedish colleagues in Orphei Drängar. 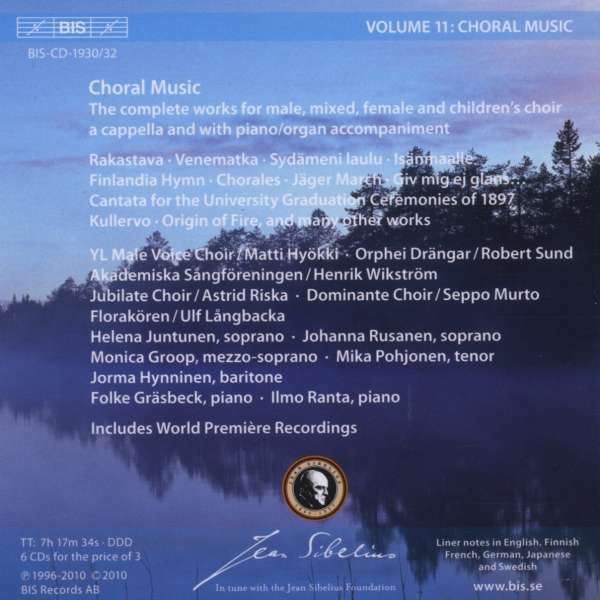 The music for mixed choir is championed by the Dominante and the Jubilate choirs, while most of the piano accompaniments are signed Folke Gräsbeck, whose recordings of Sibelius' complete music for solo piano have just been released. Hörprobe Track 7: Nr. 2: Har du mod? Nr. 2: Har du mod? Hörprobe Track 22: Nr. 2: Har du mod?